Olive Oil Dipping Dish...Pinzimonio. The terraced dipping dish is perfect for dipping your favorite olive oil, or simply add a few drops of balsamic, fresh herbs & a loaf of crusty bread for a tasty treat. The olive oil dipping dish, designed by artisan Mary Judge, is molded in Italy of terracotta clay & hand-finished with a non-toxic white glaze. 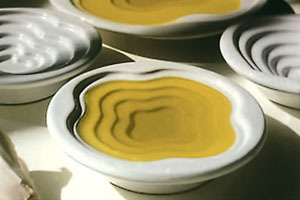 The 2-ounce dipping dish, when filled, displays a series of graduated green tones due to the depth of the olive oil in the dish. Olive Oil Dipping Dish, Pinzimonio.